Shortly after opening its doors at this spring, the Shale Resources and Society Institute (SRSI) ignited a controversy that persists several months later. The newly-founded SUNY Buffalo institute issued a study which found a decline in accidents and environmental damage caused by hydrofracking – a drilling technique using high volumes of water, sand and chemicals to extract natural gas from shale far below the Earth’s surface. Opponents call the study flawed and biased in favor of the oil and gas industry. The dispute attracted national attention, especially in the higher education community. The study was written before the official launch of SRSI and was released under its banner without significant new changes from anyone working at SUNY Buffalo. While the report’s authors admit a handful of small errors, they stand behind it and SUNY Buffalo administrators insist the institute was fulfilling its pledge to act as an information hub on fracking. Still, on August 23rd, more than 80 professors from SUNY Buffalo signed a public letter calling for SRSI to fully disclose all documents related to its founding and funding. The ongoing episode raises questions about how objective fracking research can truly be – and whether a public university, which willingly entered the topic’s often-fractious debate, can successfully navigate continued criticism. Professor Robert Jacobi loves rocks, fault lines, tectonics and other things that exist mostly below ground. As a geologist and tenured faculty member at SUNY Buffalo for three decades, he’s published volumes of research and consulted for both environmental interest groups and energy companies, including EQT, a natural gas company with hydrofracked wells in Pennsylvania. Now, as co-director of SRSI, Jacobi says he seeks to disseminate the “unvarnished truth” about hydrofracking. By drawing on multi-disciplinary expertise across SUNY Buffalo’s academic departments, SRSI plans to host classes, stage lectures, hire new professors, as well as fund and publish original research. [SUNY Buffalo] is a large, comprehensive public university with no institutional conflicts, property or vested interest in the Marcellus or Utica Shale plays — unlike industry or advocacy-based groups. Thus, it is well equipped to be a purveyor of sound, unbiased information. A number of similar institutes focusing on shale, hydrofracking and natural gas have sprung up recently at Pennsylvania State University and the University of Texas. Yet both those institutes have faced harsh criticisms that ring similar to charges eventually leveled at SRSI. The decision to greenlight SRSI came after SUNY Buffalo hosted the Marcellus Shale Lecture Series in mid-2011. Ten speakers from around the country were invited to campus to deliver public lessons on different aspects of hydrofracking, such as land leasing, property rights, permitting and "long-term build-out." The talks were well-received, timely and credible -- especially given the contentious, polarizing and sometimes juvenile nature of the public debate over hydrofracking, according to E. Bruce Pitman, dean of SUNY Buffalo’s College of Arts and Sciences, which oversees SRSI's operations. Last fall, enthusiasm stemming from the lecture series grew into informal discussions among the speakers, natural gas industry representatives and members of SUNY Buffalo’s geology department. Eventually, they agreed to establish SRSI as a credible authority on hydrofracking that would rise above the partisan nature of the debate. “[I thought], ‘Why don’t we get into this and try to create a place where there can be reasoned dialogue about what’s going on? What are the issues? What are the controversies? What is, fundamentally, the real science underneath it all?’” says Pitman. In early 2012, $40,000 from internal SUNY Buffalo funds were set aside for SRSI’s creation. The publicly-funded university financed the institute through the College of Arts and Sciences. SUNY Buffalo has not disclosed how the funds have been allocated or spent. Present at early discussions about SRSI was Dennis Holbrook, chief legal officer at Norse Energy and board member of the Independent Oil and Gas Association of New York. As a vocal and consistent voice for the gas industry, Holbrook has long advocated for hydrofracking in the Empire State. Norse located to Buffalo late last decade in anticipation of New York eventually allowing hydrofracking in areas sitting on the gas-rich Marcellus Shale formation. To Holbrook, conducting research and publishing at an academic level legitimizes hydrofracking and gives pro-drilling advocates solid information to persuade government officials and the public that this type of natural gas extraction is needed, safe, and should be legal. Robert Jacobi was employed by Norse from 2008 to 2011, making the SRSI co-director a onetime colleague of Holbrook. As a gas executive with more than three decades of energy industry experience, Holbrook makes the case that the extensive expertise of SRSI’s staff and their connections to oil and gas companies give the institute’s published work an advantage in a hydrofracking debate which, he says, is often subject to misinformation and emotion. “Even if [institutes like SRSI provide] the same message [as the gas industry], it would be [beneficial] to have those involved in academia, who would be viewed as less tied to the industry and therefore more objective,” says Holbrook. The study scrutinized more than three years of violations and accidents at hydrofracked natural gas wells in Pennsylvania. The report’s authors concluded that incidents of water contamination and other “environmental events” caused by hydrofracking became less frequent over time, which they credit to state oversight and regulation. The report goes on to argue that similar rules and regulations could be mimicked to even better effect in New York, where high-volume horizontal hydraulic fracturing ("hydrofracking") is currently under consideration. The Empire State’s draft measures are more rigorous, the study asserts, and would prevent the violations recorded at wells in Pennsylvania. Upon its release, the study was hailed by fracking proponents as convincing evidence that drilling operations can be conducted efficiently, safely and without significant harm to the environment, public or water quality. In fact, SRSI's report was used to defend hydrofracking during May 31 testimony delivered to the House of Representatives Committee on Oversight and Government Reform by Michael Krancer, secretary of the Pennsylvania Department of Environmental Protection. As co-director of SRSI, Robert Jacobi edited the report and was comfortable issuing it as a product of the institute because he determined the document to be a data-driven look at a hot button issue – exactly what SRSI aims to produce. "To me, who reviewed it, I didn’t notice [a bias],” Jacobi says.“I guess perception is reality." But some unaffiliated colleagues at SUNY Buffalo found the study to favor oil and gas interests, Jacobi admits. Ultimately, issuing the study so quickly after SRSI's launch was meant to put the institute on the radar by generating attention, interest and donations. A fully realized SRSI, with an active lecture series, research efforts, and a handful of employees including a professorship, requires “a lot of money,” says Jacobi. The price tag is quoted as $1.14 million by SRSI's website. The institute will accept donations from anybody – alumni, grants and the oil and gas industry, say SRSI organizers. But plans call for the money to be housed in a blind fund the UB Foundation, which Jacobi says will ensure researchers are not influenced by the identity or intent of funders. So far, SRSI has received one "small donation from an alumni," according to Jacobi. Whether the money was donated anonymously or housed at SRSI's fund at the UB Foundation is unclear. 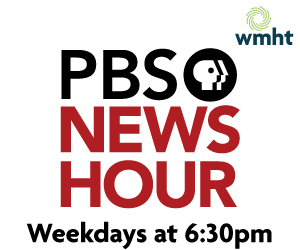 Shortly after the release of “Environmental Impacts During Marcellus Shale Drilling: Causes, Impacts and Remedies,” SRSI found itself the subject of criticism by the Public Accountability Initiative (PAI), a self-described non-profit research organization often referred to by third parties as a "government watchdog." ...identified a number of problems that undermine its conclusion: data in the report shows that the likelihood of major environmental events has actually gone up, contradicting the report’s central claim. … and [the] report’s authors and reviewers have extensive ties to the natural gas industry. Hydrofracking opponents used PAI’s overview to assert that SRSI enabled individuals with close ties to the oil and gas industry to publish under the guise of academia, benefiting from its scholarly implications. Much of the criticism was aimed at the associations of the main author of the report, John Martin, who serves as SRSI co-director -- a post he began in December 2011, five months before SRSI was first announced to the public. Martin runs his own energy consulting firm out of Saratoga Springs, New York that assists companies with oil and gas exploration and a litany of other needs. 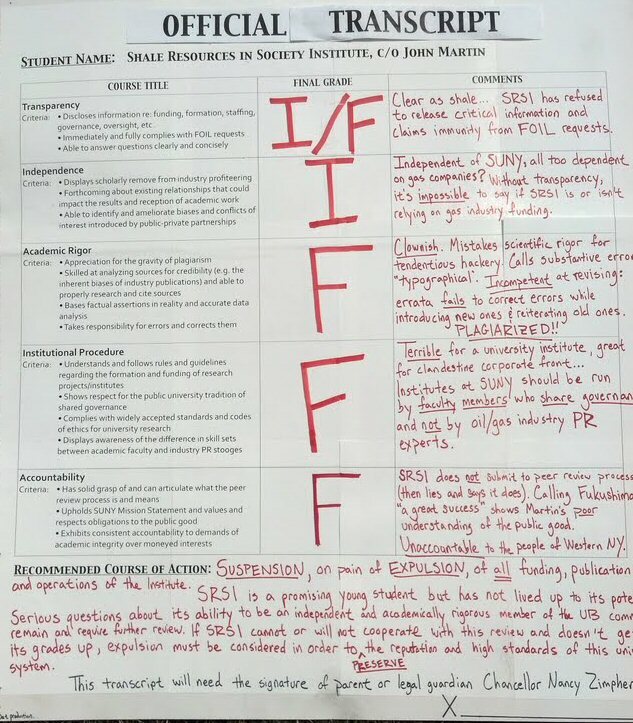 During an interview with the Innovation Trail, SRSI co-director Robert Jacobi referred to the institute's controversial study as "John's [Martin] report." Martin declined to be interviewed for this story or any other report about SRSI in the past few months. “Does [Martin] have industry connections? Yes. Can he be bought off for a couple thousand dollars from industry? C’mon. This guy has his reputation and credibility. His livelihood is dependent on his reputation and credibility,” says E. Bruce Pitman, who supervises SRSI as dean of SUNY Buffalo's College of Arts and Sciences. While SRSI's affiliations to oil and gas companies ignited intense ire, these type of professional connections are common for experienced geologists, says Jacobi. “Very few [experts in this field] will you find who don’t have an association with oil and gas who are at the same very knowledgeable. How else would you know about this stuff?” he says. In fact, these associations actually benefit research, argues Dennis Holbrook, Jacobi's former co-worker at Norse Energy. “Do you suddenly become tainted because you actually have done work at some point in time with the industry. Or does that add greater credibility because you have substantive knowledge of which you speak?” he says. [SRSI's]report lifts entire passages, without proper attribution, from an explicitly pro-fracking report released last year by the conservative Manhattan Institute and written by three of the four authors of the [SUNY Buffalo] study. While SRSI is ostensibly housed at SUNY Buffalo the institute occupies no specific space on campus. All four authors of SRSI's study all live and work in places other than Buffalo, including Considine, who works for the University of Wyoming. SUNY Buffalo’s initial press release announcing the study also contained language labeling it as “peer reviewed” – an established and widely-known form of academic appraisal used by higher education professionals to refine research before publication. While most the report's authors have experience working and publishing in higher education, critics began to question the study's "peer review" label shortly after its May release. Peer review: the "gold standard"
In late June 2012, a group of professors and students organizing under the name UB CLEAR gathered around a bullhorn and an oversized faux report card. The press conference prop gave failing and incomplete grades to SRSI in a number of areas, including following standard academic practice. “It was an egregious misstatement of fact and professional norms to characterize this [SRSI study] as peer reviewed,” says Stephen Halpern, a SUNY Buffalo political science professor and member of UB CLEAR. Despite his criticisms of SRSI, Halpern insists he doesn't hold any particular position on the safety of hydrofracking. UB CLEAR's bone to pick with its namesake school is about academic integrity, he says. Robert Jacobi, co-director of SRSI, concedes the institute’s study was not “peer reviewed” in the traditional sense. Instead, the document was informally analyzed and edited by a handful of colleagues, says Jacobi. One reviewer of SRSI's study, Scott Anderson, published an explanation the day after the report's release that "caution should be exercised with regards to some of the conclusions." Only two weeks after the study's publication, SUNY Buffalo stripped its “peer review” label. Calling the process a “gold standard” of academia, Halpern is adamant no professor should be confused about the definition of peer review. Not surprisingly, he is calling for SUNY Buffalo to explain how the label was mistakenly applied to SRSI's study. While rescinding a claim of peer review after a study's release is rare and an embarrassment in academia, institutes similar to SRSI at other universities often publish research without following traditional routes. The publishing process can lead to months or years of formal review and revision, if not outright rejection. SRSI simply did not want to wait, says Jacobi. “Every research institute does it now. It’s a way to get one leg up on the competition, and therefore get a leg up on the granting cycle or wherever the money is coming from. But ultimately you want that stuff published in a normal journal," says Jacobi. The paper is now in review at an academic quarterly, says Jacobi, though he declined to name which one. SRSI's go-ahead publication of its first study is a demonstration of placing the cart before the horse, say members of UB CLEAR. “This is not how academics do research. We spend the time. We spent years doing research,” says David Kowalski, a member of UB CLEAR and professor emeritus in both the Department of Cancer Genetics at Roswell Park Cancer Institute and Cellular & Molecular Biology Program with Roswell Park Graduate Division, SUNY Buffalo. Now, language on SRSI's website states: "It is SRSI policy to encourage its researchers to publish their research findings in peer-reviewed, professional, or scholarly journals." Meanwhile, SUNY Buffalo administration has defended SRSI, saying academics are free to study and draw conclusions about their topics of choice, however controversial. The university's role is to create a forum for objective research and informed debate -- not to dictate the positions taken by its faculty members. … The university views the work of [SRSI] as fully consistent with UB's mission as a public research university. UB has no plans to alter or suspend the operations of the institute. SUNY Chancellor Nancy Zimpher weighed in on the matter, asking SRSI to "counter" building criticism. However, SUNY Buffalo’s responses to criticisms, including a late-May statement by Pitman defending SRSI’s work on the grounds of academic freedom, did not pacify UB CLEAR. The professors in UB CLEAR are adamant that criticizing their employer is a duty that will ultimately aid the school in improving the operation and oversight of SRSI. Summers are usually quiet at SUNY Buffalo. Faculty are often off-campus, administrators burn off unused vacation time and students not attending summer classes are normally elsewhere. But for SRSI, this summer’s controversy hampered what was supposed to be an auspicious launch. “It has delayed the money. Trucks aren’t rolling up with tons of money. From anybody,” Jacobi says, laughing. SRSI’s lack of donations so far has slowed the institute's plans, including the hiring of an administrative assistant and professor, though not its course offerings to SUNY Buffalo students. The institute has used the past few months to regroup and consider how to proceed post-controversy. Most of SRSI leadership’s time and energy has been taken up deflecting criticism lately, says E. Bruce Pitman, dean of SUNY Buffalo’s College of Arts and Sciences, which funded SRSI's formation. “We haven’t been able to get past the noise on the extremes in order to actually begin to talk about what’s sensible and serious here,” says Pitman. "We've been fending off nonsense. ... [But] we’re going to continue to march on." SRSI leadership has also used the summer to develop strategies to raise money. Accepting funding from the oil and gas industry will be a part of the institute's future. But Pitman is quick to point out that grants and alumni funding are likely to be a part of SRSI's income as well. SRSI’s advisory board will soon consider codifying rules and regulations to guide the institute and ward off potential concerns. As part of that process, Pitman says industry funding will not be labeled as such and will be housed blindly in accounts managed by the UB Foundation. With the start of the fall semester, the advisory board will vote on the measures over the next few months, says Pitman. While SUNY Buffalo and SRSI leadership are attempting to move on from this summer’s drama, the members of UB CLEAR are not finished trying to learn more about the founding of the institute and its inner workings; hence the letter to the university's administration asking for all documents related to SRSI’s creation and funding to be made public. Otherwise, Halpern says, SRSI creates the suspicion that it is too close to oil and gas companies to be regarded as independent – especially at an academic institution.